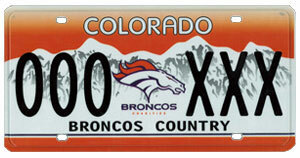 Show your Broncos pride on your ride! 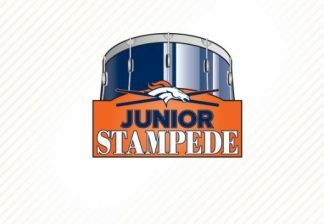 All Colorado residents who make a one-time $30 minimum donation to Denver Broncos Charities will be eligible to purchase a set (front & back) of Denver Broncos license plates. Denver Broncos Charities will issue a Pin # via email confirming the donation has been received. Please enter your name (first, middle, last) exactly how it appears on your title complete notice or vehicle registration. All Broncos License Plates proceeds ($30 donation per plate) go to Denver Broncos Charities programs that improve lives in our community by focusing on Youth Development, Quality of Life, Health & Wellness, Youth Football and Civic Engagement. Alongside key community partners in each focus area, we are able to make a difference through strategic programming, unique events and dedicated advocacy. Please allow 2-4 weeks to receive your Pin # via email. Please note: License Plate Certificates of Approval will be sent to this address.